This is an engaging mystery and a good audio listen. In the late 90s, a bad cop killed a good woman and DC Homicide Detective Marty Singer got to watch as the murderer walked out of the courtroom a free man. Twelve years later, the victim's daughter comes to Marty begging for help: the killer is stalking her now. There's just one problem: Marty's retired...and he's retired because he's battling cancer. But with a second shot at the killer - and a first chance at redemption - Marty's just found…a reason to live. Marty Singer recently retired as a DC Homicide cop when he learned that he has cancer. Shortly before he is to begin his chemo treatments an unexpected visitor knocks on his door. Amanda is now a graduate student who remembers Marty as the lead Detective in the case against Michael Wheeler, her mother’s murderer from twelve years before. Although Wheeler walked free due to trial errors and lost evidence, Amanda is sure that Marty can help her. She needs protection because the killer is back, leaving white carnations at her door. Marty vows to protect Amanda and sets off to try to locate Wheeler, a cop who was stalking Amanda's mother before the murder. Wheeler apparently disappeared shortly after the trial and there is little trace to follow. Marty seeks help from his old partner who is still angry about the botched trial but agrees to help. Trying every lead he can, Marty practically accosts Julie, the defense attorney who represented Wheeler. The trial win should have jump-started her career but, because it was clear that the prosecution mishandled the case, she didn’t get the positive response she hoped for. She is pretty bitter about the whole matter and doesn’t really want to talk about it or Wheeler. Amanda goes into hiding with Marty as she is still being followed. Soon Marty discovers intruders in his home but he can’t figure out who these goons are who are ransacking his house for his files. Threats and circumstances change Julie’s mind so that now she returns to Marty and now all three are hiding from an unknown threat as well as the killer. Marty continues to investigate even as his usual strength and reactions fail him due to weakening from the chemo treatments. There is good suspense, action and twists in this mystery thriller. It is very sharp and realistic with ‘real-to-live’, characters complete with physical (age and illness), mental (madness and weakness) and moral (greed, pride and more) flaws. Some of the investigation paths lead to dead ends which adds to the realism. Also, the primary hero being older and coping with cancer issues makes him an interesting character with more depth than some young, hot shot detective. 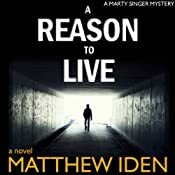 Mr. Iden does a good job of weaving in unexpected twists, a little bit of romance and a bit more of moral dilemmas that have the reader/listener pondering levels of madness, ethics, loyalty and honesty. How far do professionals go to protect themselves, their families and their clients? I like Marty as a character and love the crisp suspense. I recommend this to mystery readers and would enjoy more suspense stories featuring Marty's tenacious pursuit. I received this audiobook for review from the author.